The Problem: You want to start hacking away at a WordPress Theme and get your site online. You don’t want to start with a Parent Theme, or a Theme Framework. You want to make your own theme—and you want it to be ready for HTML5. Only, you don’t know where to start. The Solution: Start your WordPress theming engines! The delightfully blank, and stripped down, Toolbox theme is here. In 2010 WordPress will get a new Default Theme, replacing the beloved/hated Kubrick Theme with a new Theme called 2010. I’ve got opinions on the matter. Oh, do I have opinions. 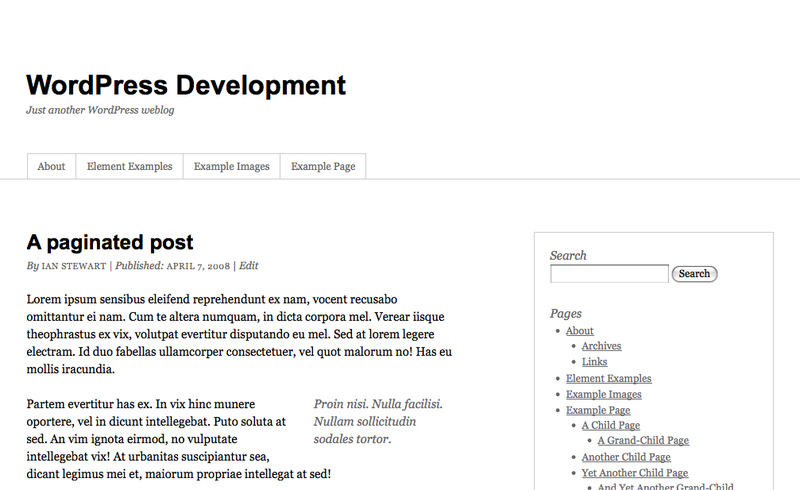 I’ve even gone so far as to create a working idea for a new Default WordPress Theme. Read on to find out more. I’ve set myself some principles for designing a Default Theme. These 3 principles sound pretty simple, right? Well, not really. If you’re just talking about them, yeah maybe. But talking about a WordPress Theme doesn’t make one. Are they so simple when you actually try and make a WordPress Theme that follows these principles? First of all, it’s relatively easy to design a WordPress Theme knowing it will only be used by people who have a specific purpose for it. You only download a WordPress Theme if you want to use it, right? Well, how do you design a WordPress Theme that will be forced on people? Most especially, forced on people who are new to WordPress? People who may take one look at the Default Theme and slap their monitors in horror lest they look on something so hideous, so, so limiting ever again? Plus, who says a Default Theme should look like a “blog” Theme? And, while knowing that most people start their WordPress-theming with the Default Theme and, increasingly, their web designing with the Default Theme—knowing and suffering under that awful pressure and responsibility—how do you make it easy to tweak simply and make it easy to Child Theme—without turning it into a Framework Theme. Trust me here. While people may be asking for a Framework as the Default Theme they’re not all asking for the same thing. Something as robust as Thematic will have people running screaming away from it. People that want Framework Themes can download Framework Themes. I’m not so sure every new user should have one forced on them.